Location Location Location - Old world charm in Downtown Milford. 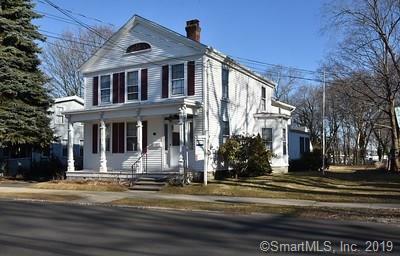 Fantastic opportunity to own a comfortable 4-bedroom colonial that has been lovingly maintained throughout the years. Features include newer roof, siding, front porch and furnace. Enjoy large windows and sun filled rooms with hard wood floors. Enjoy the luxury of space with an entry foyer that leads into a formal living room and dining room, 1st floor den and an eat in kitchen. Walk up attic is perfect for storage or expansion options. The three-season porch overlooks the deep private backyard that is mostly fenced in. A two-car detached garage, built in 1985 sits to the side of the property with a 2nd story loft that has endless possibilities (office, rec room, crafts or work shop). Short walk to train, fine dining, small shops, harbor and beach. Easy access to all major highways. Not to be missed if the Heart of Milford is where you want to be!